Best VPN For Apple TV - Unblock Apple TV & Watch Now! Summary: If you travel outside the US or you live outside the US, you’ll likely run into a blockade if you try to watch Apple TV. This is because your computer thinks you are not located in the US (which you probably aren’t) and restricts you from accessing it. You can get around Apple’s restrictions through the use of a Virtual Private Network (VPN). A VPN will hide your IP address and assign you a new one that will allow you access to Apple TV. To Unblock Apple TV and access from anywhere get Express VPN. Why Am I Blocked From Watching Apple TV? 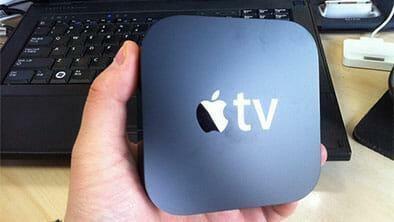 Apple TV is a source of boundless multimedia content including music, TV shows and movies. For most of us, streaming content directly from Apple TV is a great way to access massive amounts of entertainment media from the comfort of your own home. However, those living outside the US don’t get to take advantage of Apple TV’s convenience and features. This is because Apple TV restricts people outside the U.S. from accessing their services. Apple TV is able to restrict viewers outside the U.S. through each device’s Internet Protocol (IP) address. When someone attempts to connect to Apple TV, the device’s IP address is referenced to determine the device’s location. If the IP doesn’t originate from the US, Apple blocks that device. Fortunately, this can be overcome by a VPN service. Using a VPN allows you to access Apple TV by using one of the VPN’s server within the U.S.
By doing this, all websites and servers you access, including Apple TV, will see your device as located within the U.S. Ta da, you now have access to Apple TV! To help take advantage of everything Apple TV has to offer, here are our top three VPN choices to use with Apple TV. Express VPN is our top choice to watch Apple TV outside the USA. It is very affordable at $8.32 per month with a 12-month subscription and you get a 100% money-back guarantee during your first 30 days. The best part though, is the great features you get for that affordable cost. Express VPN works across all major platforms, including Windows, Mac, iOS, and Android. You can even use Express VPN on 1 computer and 1 handheld device at the same time. Regardless of your favorite device, Express VPN works on it and you will be able to watch Apple TV anywhere in the world. Express VPN also offers unlimited bandwidth, unlimited speeds, no logging of your Internet activity and they boast an amazing 99.9% uptime rate. They also have the highest level security available (256 bit encryption) and a huge range of servers available all over the world. You won’t have any problems connecting to Express VPN during your next trip outside the U.S.
Their fast speeds also mean you will definitely be able to stream your favorite movies and shows from Apple TV. Once you are outside the U.S. you won’t have any problems connecting to Express VPN to catch up on your favorite shows and movies. They provide almost 100 VPN locations across 78 countries and are always adding more. With over 43,000 IP addresses to choose from means you won’t have to share or be slowed down. If you have any problems using Apple TV on your next trip abroad, the experts at Express VPN are standing by around the clock with 5-star live chat and email support. You won’t wait long either, Express VPN has in impressive average response time of under 30 minutes. All these features at a great price – no wonder Express VPN is our top choice to use Apple TV the next time you’re outside the U.S.
Visit Express VPN’s site to sign up and we know you won’t be disappointed. In fact, after you see how great Express VPN is, you’ll want to tell all your friends and colleagues, and with Express VPN’s referral service you’ll receive 30 days of free service for each friend’s signup. To securely access Apple TV outside the US, get Express VPN now. If you’re looking for a VPN to use to access AppleTV, one thing’s for sure – it needs to be fast. IPVanish has a connection that can keep up, making it great for streaming all of your favorite TV shows and movies. Plus, like Express VPN, these guys also offer unlimited bandwidth and two simultaneous connections with their service plans, so you and the kids can both unwind to your favorite shows. There are of course, some drawbacks. IPVanish is great, but it’s not nearly on the same level as Express VPN. The biggest thing is that IPVanish’s software isn’t compatible with every operating system. Though it will work on Windows, Mac, Android, and Linux devices, it’s incompatible with iOS, so iPhone and iPad users are out of the running. Their customer service isn’t quite as good either – it’s 24/7, but doesn’t have a live chat support feature like ExpressVPN. The real bummer is that it usually takes at least a few hours to get a response on an e-mail query. IPVanish has a solid connection, but with only a 7 day guarantee and no referral program, their service lacks a lot of the features and flair Express VPN’s has. IPVanish can be found at this website. If you can’t seem to connect to an Express VPN server and still need a VPN option that’s going to work on your iPhone or iPad, HideMyAss is another option to consider. HideMyAss, like Express VPN, is compatible with most operating systems. They have one of the largest networks in the world, with 151 locations around the globe. However, there are some major issues with HideMyAss’s connection. For one thing, it’s slow, like really slow, and definitely too slow to stream AppleTV without saying some choice words. With this VPN, there’s a whole lot of buffering, and not a whole lot of playback. On top of the connection with HideMyAss being slow, it’s incredibly unreliable. In the past when I’ve used this VPN, it didn’t seem to matter which server I connected to, my connect was dropped at least once in a session. Not only is this just plain irritating, but it leaves your data wide open when the VPN fails. HideMyAss has a lot of ways to get in touch with their support. Any time, day or night, you can reach them by phone, live chat, or e-mail. The real issue is that it takes them at least 12 hours to respond to e-mails most of the time – often longer. Even their live support isn’t reliable. Their chat is sometimes offline, and their phone support will have you hold for at least a few minutes the majority of the time. HideMyAss has the servers and the unlimited bandwidth that a lot of people looking to stream AppleTV are after, but the only feature worth knowing about with this VPN is their 30 day guarantee. Plan on cashing in on that. Otherwise, just save yourself the trouble and use Express VPN instead. Although Apple restricts their service to US users only, by using a VPN you can take advantage of the convenience and incredible selections from Apple TV. The right VPN will allow you to stream your favorite Apple TV content while providing great protection. The best VPN, hands down, is Express VPN. It’s fast, easy, and reliable. They offer superior encryption, stellar customer support, and back it all with a 30-day money-back guarantee.